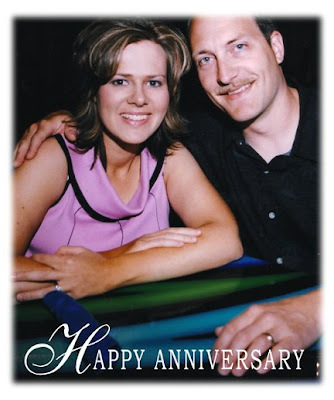 Wordless Wednesday - To My One and Only! 1. A smile is universal. 2. Scrabble is my favorite board or card game. 3. I would love to have more relaxation in my life and less stress. 4. When I think of the Summer Solstice, I think of playing red light, green light as a kid in the yard until 10 pm and listening to the frogs in the creek and seeing the fireflies come out when the sun finally went down. 5. I just remembered I need to make a salad for tomorrow (see #7). 7. And as for the weekend, tonight I’m looking forward to going to the Chanhassen Dinner Theater and seeing Married Alive, tomorrow my plans include going to a graduation party and then going to a birthday party for my brother, sister, and brother-in-law (yes we have three birthdays right in a row) and Sunday, I want to visit with my mom and dad before they go back home! Wordless Wednesday...fresh out of the oven! 1. Getting a drum carder is high up on my bucket list. 2. My favorite quote is Trust in the LORD with all your heart and lean not on your own understanding; in all your ways acknowledge him, and he will make your paths straight; it's from Proverbs 3:5-6. 3. Denise@knitchat.com inspired me to start blogging. 4. Strawberries are best fresh from the garden. 5. I was spinning in the last dream I remember having. 6. The most enjoyable time to go for a walk is in the evening after it cools down and the sun is setting. 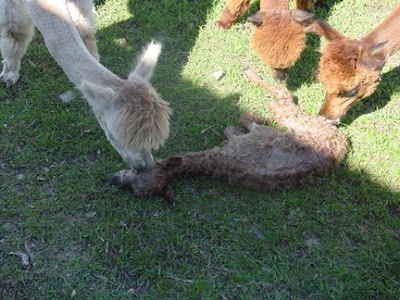 tomorrow my plans include spinning more of our freshly shorn alpaca and Sunday, I want to celebrate Father's Day! I hate to say this, but I have one of those obsessive compulsive personalities. I usually get completely and totally obsessed with something, can't get enough of it, and eventually crash and burn out on it, sometimes I completely abandoned it and never look back (rubberstamping anyone?). Sometimes something else waves itself in front of my face and tempts me away from my current fascination. Well, something waved itself in front of my face and I hate to say it, but I can't seem to stop playing around with my new found toy. I am now spinning with my drop spindle like a mad woman! First off, I have been completely obsessed with figuring out how to use my drop spindle. There was just something about it that fascinated me to no end. I love the idea of being able to bring my spinning with me whereever I want to go (can't do that with a wheel). Thanks to Nancy, I finally know how! 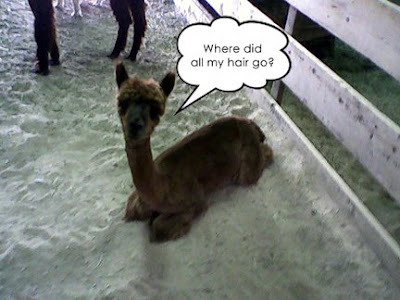 Second, I needed to know how to wash my alpaca fleece. I was terrified of ruining the best stuff (I ruined some the first attempt I made at washing a batch). Thanks to Teresa, I now know how! I filmed her prepping a fleece and washing it. I will be making that into a DVD soon (I just need to get through some of my fleece first since I have lots of it now). I needed to know how to use my hand carders to make rollags, and thanks to good old Ravelry.com and youtube.com I soon had a basket of goodies ready to spin! 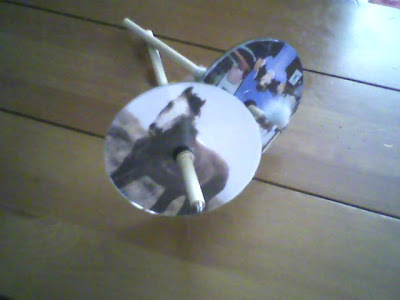 Using the easy to follow directions in my copy of Spin It, I even made my stepdaughters drop spindles using old cds, rubber grommets, a dowels and an eye hooks. They each picked out a photo to make it their own. We all sat around spinning most of the day. We almost forgot to eat! My youngest reminded us in a hurry that it was well past meal time! I've even managed to go from super duper bulky to worsted weight in less than a week! 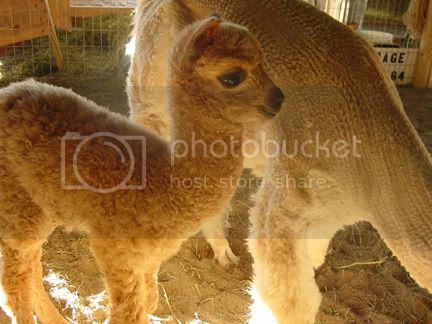 I am aiming for DK or sport weight so I can make a pair of alpaca socks! 1. Idle hands are not mine, I have them doing something all the time. 2. I love to hang my hanks of handspun up in the shower. 3. My favorite time of the day is when I can do my arts and crafts. 4. The last tea I drank was yesterday, I had spiced chai. 5. I like to go boating in the Summer. 6. My mother always said I can do whatever I put my mind to. 7. And as for the weekend, tonight I’m looking forward to spinning, tomorrow my plans include spinning some more and Sunday, I want to spin some more(can you tell I am completely addicted?)! 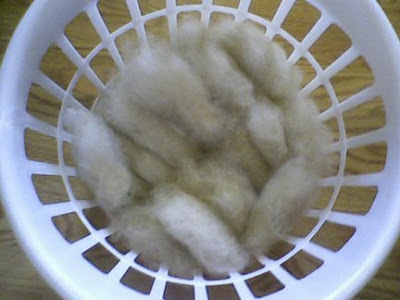 Wordless Wednesday - Shearing day was a success, fleece now for sale!